Pizza night is a regular thing at my house, and sometimes I just want a grown-up pizza. Good thing this Greek Pizza is just as easy to make as regular pepperoni! 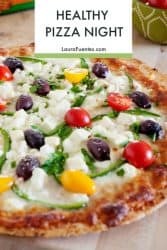 What Makes Greek Pizza Different? 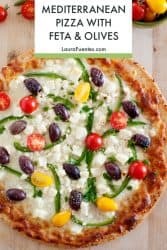 Instead of the regular cheese and pepperoni, Greek Pizza is topped with crumbly Feta, olives, bell pepper, and grape tomatoes. Everything else is pretty much the same, soft, doughy crust, melted cheese, slightly charred veggies… I think the term “a slice of heaven” would be appropriate here. For occasions such as this, I like to keep homemade frozen pizza dough and frozen cheese pizza on hand. 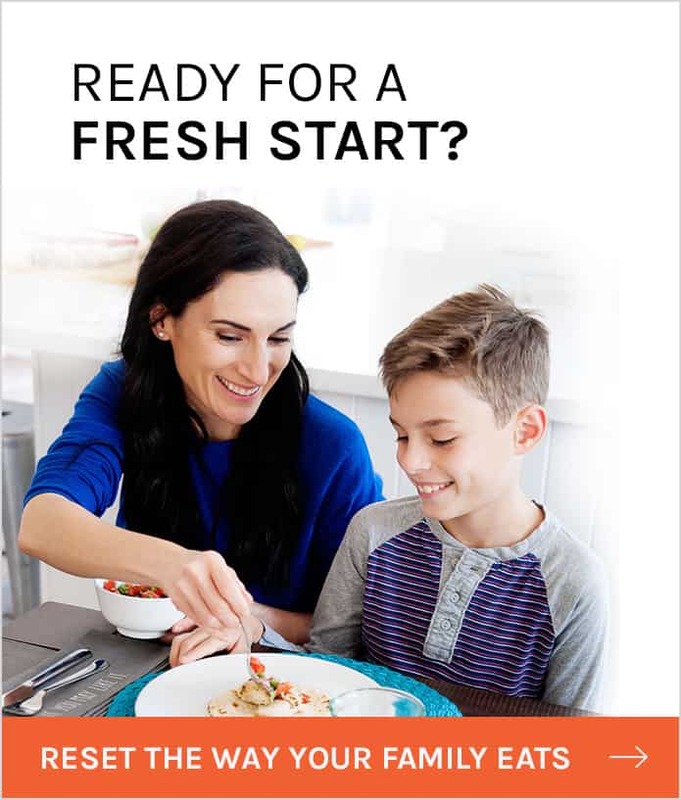 Both methods taste better and take less time than the delivery option. 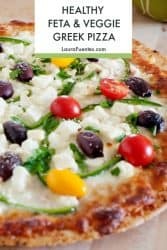 If you are grain-free, you can still have this delicious Greek Pizza. 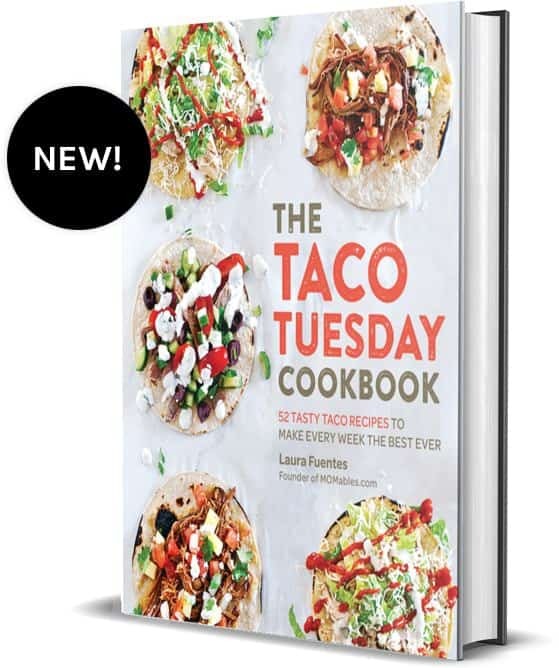 Instead of using the frozen pizza crusts you can use my grain-free pizza crust recipe instead. 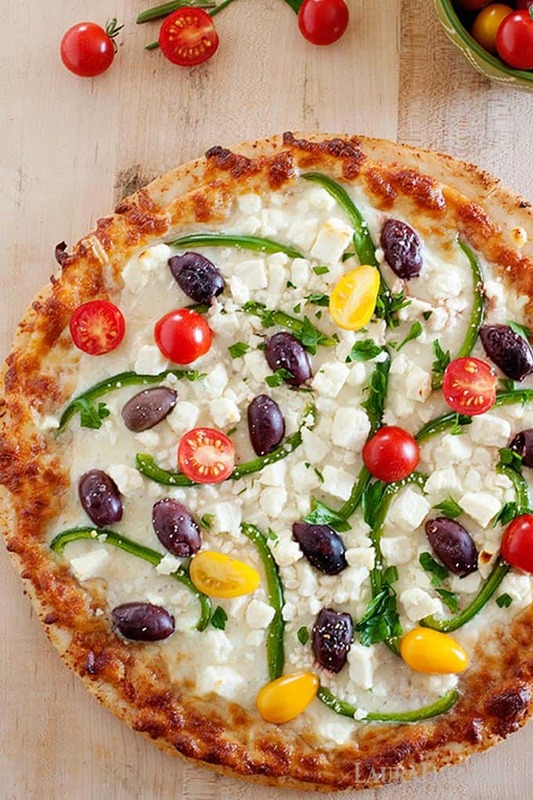 One you have your crust figured out, it’s time to move on to the delicious Mediterannean toppings. 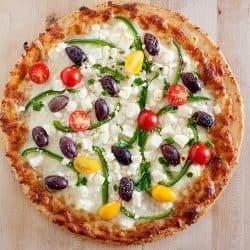 Feta cheese and Kalamata olives are essential to Greek pizza, I also like to add chopped bell pepper and grape tomatoes for good measure but from there I’ll let you make the executive decisions. What Else Can You Put on Greek Pizza? If you’re all about that loaded pizza life I get it! 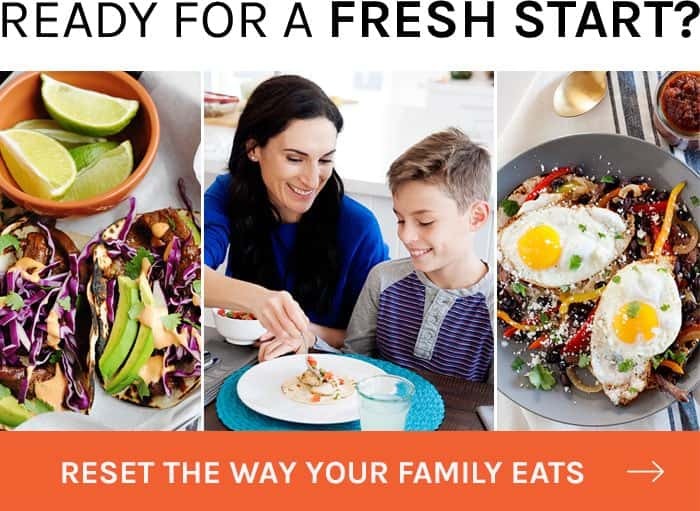 Since I’m raising a picky eater crew I usually have two options: the classic cheese or pepperoni for the kids and a ”fancier” option like Greek Pizza or Taco Pizza for Eric and I. When pizza is involved, it’s hard to go wrong. 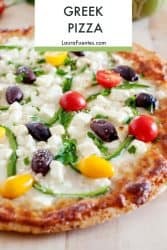 What Kind of Cheese is on Greek Pizza? 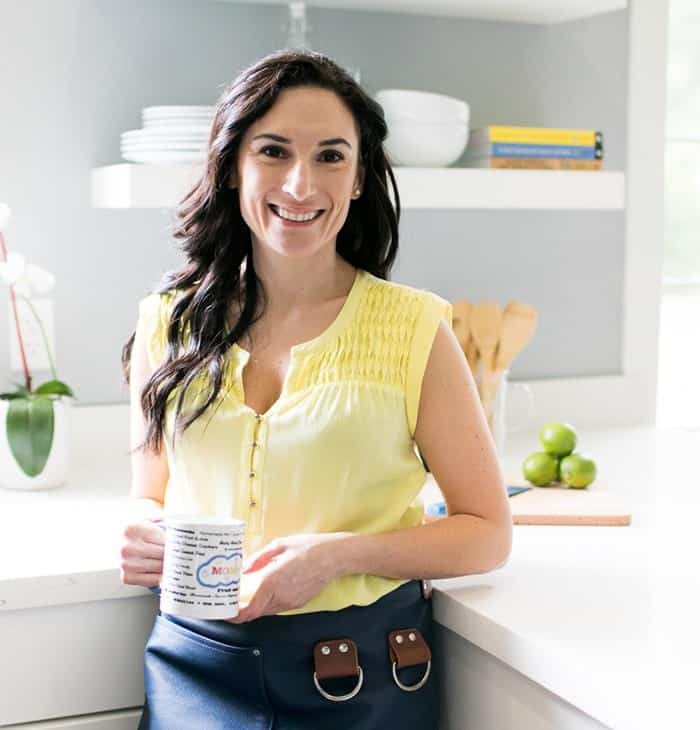 You say Greek food, I think feta so of course, it would be the only cheese to use for this recipe. Once baked it’s creamy, slightly melted and the real MVP for Greek Pizza. What are some of your family’s favorite pizza combos? 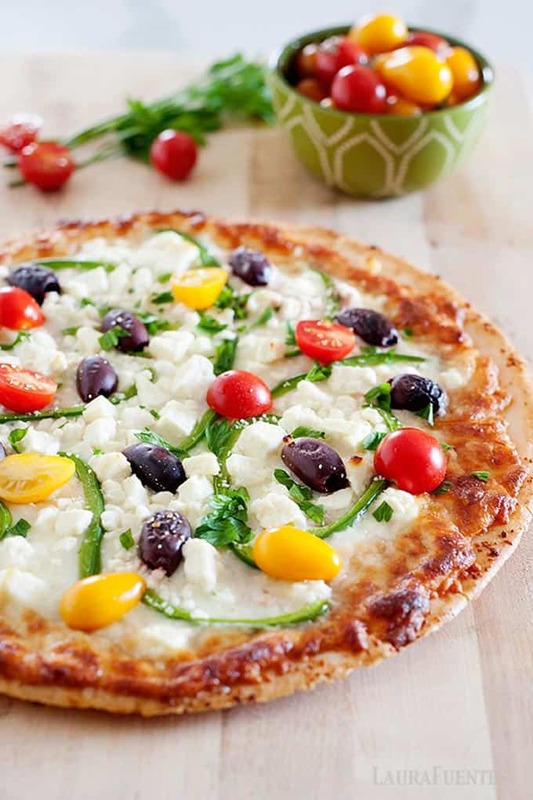 Greek pizza is perfectly cheesy, crispy and has all the Mediterranean flavors you love. 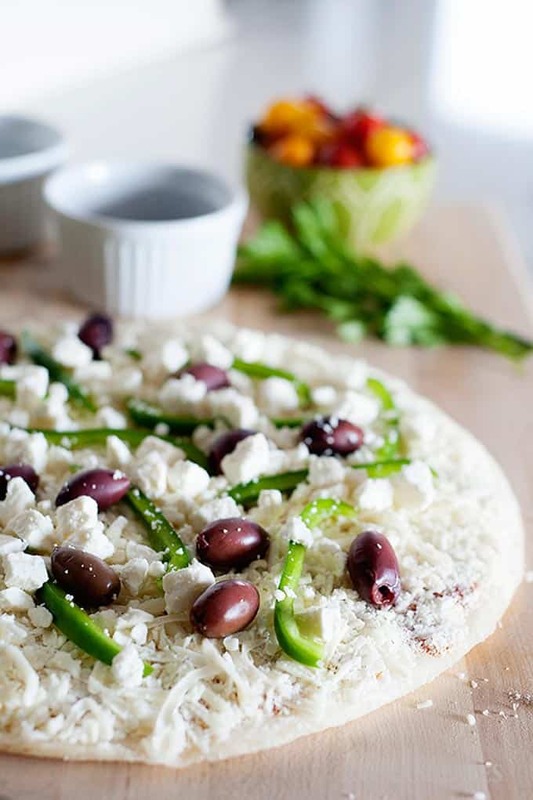 Place frozen cheese pizza on a flat surface and top with green peppers, Kalamata olives, and Feta cheese. Bake, 12-15 minutes, until crust, is golden and cheese is melted throughout. Remove from oven and top with grape tomatoes –although these can be baked, your choice. Sprinkle with parsley, for garnish.